The first person to introduce alternative to ST was Hernandez in 1986,  an oral and maxillofacial surgeon. His aim was to avoid ST complications, in cases where orotracheal or nasotracheal intubation were not feasible, long-term postoperative ventilation or protection of airway is not anticipated, and free surgical access to restore the fragmented bones to its normal anatomy. ,,, Having it done by the same surgeon is probably an additional reason, is the author's opinion. The selection criteria put were, craniofacial injuries with associated fractures of nasal bone and skull base, orthognathic surgeries, elective esthetic face surgeries, repair of congenital malformations, multiple or complex facial osteotomies, and transfacial oncologic procedures of the cranial base. , The object of this study is to critically discuss the aims, indications, surgical steps, limitations as well as complications of the alternatives and why they are considered by advocators to be superior to ST. A review of related PubMed English publications with correspondences including oral, maxillofacial, dental, skull base, anesthesia as well as otolaryngology journals of the last 30 years is made. Submental and submandibular spaces are potential spaces of the anterior triangles of the neck. The submental space lie below the chin and bounded by the anterior bellies of digastric muscles, midline, and hyoid bone. Its contents include lymph node and submental salivary gland. While the submandibular space lie below the body of the ramus of the mandible, bounded by the inferior margin of the mandible and the anterior and posterior bellies of digastric muscles. Deep to it are the stylohyoid and mylohyoid muscles. It contains the submandibular salivary gland, deep fascia, lymph nodes and anterior facial vein, facial artery and marginal mandibular branch of the facial nerve. After selecting a suitable size armoured ET, patient is inducted and ventilated. The fixed universal connector is replaced with a removable one. A 2 cm submental incision is done just medial to the lower border of the mandible, about one-third between the symphysis and the angle of the mandible and parallel to it. Blunt dissection is carried out with artery forceps through the skin incision toward the mouth cavity while pushing the tongue backward, till the tip tents the mucosa of the floor of the mouth anterior to Wharton's duct papillae. The mucous membrane is incised to introduce the tip of the forceps. With a forceps the ET tube end is grasped and pulled through the tract formed to the submental skin and fixed with sutures. The removable connector is re attached and ventilation continued through the ET. Martinez-Lage et al.,  in 1998 was the first one to propose it as an alternative to nasotracheal intubation and tracheostomy. The space is assessed by passing the index finger in the retromolar space and closing the jaw. A missing or impacted third molar creates the space required; ,, otherwise, a semilunar osteotomy or the concurrent third molar extracted as originally described. The later procedures were later abandoned due to its high morbidity. After orotracheal intubation with a suitable ET, it is passed in the retromolar space and secured to an adjacent tooth with a dental wire to lie below the exclusion plane. The tube is connected and ventilation continued. The general consensus of ST benefits includes reduced risk of laryngeal injury, weaning from intermittent positive pressure ventilation, less sedation, improved patient comfort, communication, and oral hygiene. Furthermore, it provides improved care for patients in the trauma or critical care setting and reduces the hospital and patient costs. , Nevertheless, ST is not complication free, there are certain reported risks in neonates, morbid obesity, short neck, cervical stiffness, tumors with neck infiltration and thyroid gland masses. , However, it remains the procedure of choice in these cases  and the option of alternative to ST and percutaneous tracheostomy here is questionable for obvious reasons. For a short anticipated airway access most of these complications are not expected as so as they are late ST complications, furthermore, any resulting ugly scar for the sake of safety is the least concern in these cases, especially in severe maxillofacial traumas. Practically speaking alternatives to ST is a blind procedure, with a potential risk of injury to the structures and organs in the submandibular and submental spaces, described above. ST is as a simple and safe procedure for high-risk patients and difficult airways ,, as well as helpful in removing aspirated teeth complicating maxillofacial trauma. Moreover, surgeon's experience is not mandatory  and if warranted done under local anesthesia. In contrast, alternative to ST is done exclusively by named specialities for selected cases only and demanding certain technical skills. It carries its own morbid and potential complications , and moreover, problems faced when urgent airway access is required postoperatively ,, especially in cases when short term intubation in is not anticipated. [Comparison [Table 1]]. Innovative procedures that were meant to avoid ST, are for selected cases, require certain surgical skills, and have airway risks in cases when short-term intubation is not anticipated; furthermore, it is done by named surgical specialities. On the contrary, ST remains to be simple, safe, and the procedure of choice for either short- or long-term airway control, especially in emergencies and difficult airway cases. Moreover, it is not limited to any surgical specialty and requires no surgical experience. However, regular workshops are recommended for this highly in demand procedure. 1. Goldenberg D, Ari EG, Golz A, Damino J, Netzer A, Joachims HZ. Tracheostomy complications: A retrospective study of 1130 cases. Otolaryngol Head Neck Surg 2000;123:495-500. 2. Caron G, Pasquin R, Lessard MR, Trepanier CA, Landry PE. Submental endotracheal intubation: An alternative to tracheostomy in patients with midfacial and panfacial fractures. J Trauma 2000;48:235-40. 3. James D, Crockord HA. Surgical access to the base of the skull and upper cervical spine by extended maxillectomy. Neurosurgery 1991;29:411-6. 4. Gulsen S, Ulen M, Dinc AH, Altinors N. Clinically correlated anatomical basis of cricothyrotomy and tracheostomy. J Korean Neurosurg Soc 2010;47:174-9. 5. Shutz P, Hamed HH. Submental intubation versus tracheostomy in maxillofacial trauma patients. J Oral Maxillofac Surg 2008;66:1404-9. 6. Anwer HM, Zeitoun IM, Shehata EA. Submandibular approach for tracheal intubation in patients with panfacial fractures. Br J Anaesth 2007;98:835-40. 7. Biglioli F, Mortini P, Goisis M, Bardazzi A, Boari N. Submental orotracheal intubation: An alternative to tracheostomy in transfacial cranial base surgery. Skull Base 2003;13:189-95. 8. Das S, Das TP, Ghosh PS. Submental intubation: A journey over the last 25 years. J Anaesthesiol Clin Pharmacol 2012;28:291-303. 9. Nwoku AL, Al-Balawi SA, Al-Zahrani SA. A modified method of submental oroendotracheal intubation. Saudi Med J 2002;23:73-6. 10. Nyarady Z, Sari F, Olasz L, Nyarady J. Submental endotracheal intubation in concurrent orthognathic surgery: A technical note. J Craniomaxillofac Surg 2006;34:362-5. 11. MacInnis E, Baig M. A modified submental approach for oral endotracheal intubation. Int J Oral Maxillofac Surg 1999;28:344-6. 12. Hernandez Altemir F. The submental route for endotracheal intubation. A new technique. J Maxillofac Surg 1986;14:64-5. 13. Chris RJ. Surgical anatomy of the neck. In: Michael G, editor. Scott-Brown′s Otorhinolaryngology, Head and Neck Surgery. 7 th ed. London: Hodder Arnold; 2008. p. 1741-5. 14. Biglioli F, Galioto S, Gianni AB, Autelitano L, Goisis M. Applicazione della tecnica di intubazione orotracheale con passaggio submentale nei trauma maxilla-facciali. Riv It Ch Maxillofac 1999;10:19- 21. 15. Stoll P, Galli C, Wachter R, Bahr W. Submandibular endotracheal intubation in panfacial fractures. J Clin Anesth 1994;6:83-6. 16. Martinez-Lage JL, Esclava JM, Cebrecos AI, Marcos O. Retromolar intubation. J Oral Maxillofac Surg 1998;56:302-5. 17. Dutta A, Kumar V, Saha SS, Sood J, Khazanchi RK. Retromolar tracheal tube position for patients undergoing faciomaxillary surgery. Can J Anaesth 2005;52:341. 18. Lee SS, Huang SH, Wu SH, Sun IF, Chu KS, Lai CS, et al. A review of intraoperative airway management for midface facial bone fracture patients. Ann Plast Surg 2009;63:162-6. 19. Rungta N. Technique of retromolar and submental intubation in facio-maxillary trauma patients. Ind J Trauma Anaesth Crit Care 2007;8:573-5. 20. Hernandez Altemir F, Hernandez Montero S, Hernandez Montero S, Moros Peria M, Hernandez Montera E. Avoiding tracheostomy: Submental intubation in faciomaxillary trauma surgery. Plast Reconstr Surgery 2005;115:349-51. 21. Chris RJ. Surgical anatomy of the neck. In: Michael G, editor. Scott-Brown′s Otorhinolaryngology, Head and Neck Surgery. 7 th ed. London: Hodder Arnold; 2008. p. 2295-7. 22. McCormik T, Venn R. Recently published papers: Tracheostomy: Why rather than when? Obesity: Does it matter? And stroke: Diagnosis, thrombosis and prognosis. Crit Care 2007;11:127. 23. Freeman BD. Is there a hidden benefit associated with early tracheostomy? Crit Care Med 2008;36:2688-9. 24. Mort TC. The incidence and risk factors for cardiac arrest during emergency tracheal intubation: A justification for incorporation the ASA Guidelines in the remote location. J Clin Anesth 2004;16:508-16. 25. Nowak K, Szyfter W. In the case of "difficult" tracheostomy. Otolaryngol Pol 2008;62:11-5. 26. Shaha AR, Burrnett C, Alfonso A, Jaffe BM. Goiters and airway problems. Am J Surg 1989;158:378-80. 27. Halum SL, Ting JY, Plowman EK, Belfasky PC, Harbarger CF, Postma GN, et al. A multi-institutional analysis of tracheostomy complications. Laryngoscope 2012;122:38-45. 28. Stock MC, Woodward CG, Shapiro BA, Cane RD, Lewis V, Pecaro B. Perioperative complications of elective tracheostomy in critically ill patients. Crit Care Med 1986;14:861-3. 29. Wang B, Sun A, Liao J, Liu H, Zhu C. Tracheostomy in patients with liver transplantation. Lin Chuang Er Bi Yan Hou Ke Za Zhi 2006;20:880-2. 30. Smith DK, Grillone GA, Fuleihan N. Use of postoperative chest x-ray after elective adult tracheostomy. Otolaryngol Head Neck Surg 1999;120:848-51. 31. Futran ND, Dutcher PO, Roberts JK. The safety and efficacy of bed side tracheostomy. Otolaryngol Head Neck Surg 1993;109:707-11. 32. Haspel AC, Coviello VF, Stevens M. Retrospective study of tracheostomy indications and perioperative complications on oral and maxillofacial surgery service. J Oral Maxillofac Surg 2012;70:890-5. 33. Jaryszak EM, Shah RK, Amling J, Pena MT. Pediatric tracheostomy wound complications: Incidence and significance. Arch Otolaryngol Head Neck Surg 2011;137:363-6. 34. Blot F, Melot C. Commission d′Epidemiologie et de Recherche Clinique. 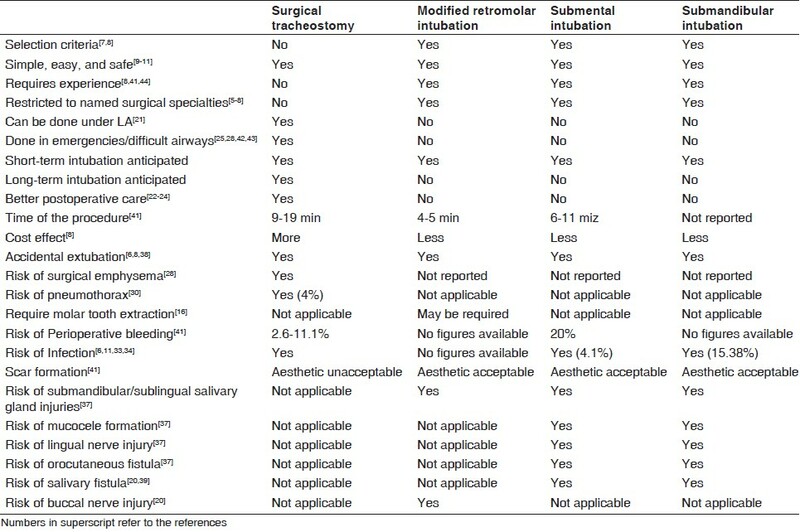 Indications, timing and techniques of tracheostomy in 152 French ICUs. Chest 2005;127:1347-52. 35. Chris RJ. Surgical anatomy of the neck. In: Michael G, editor. Scott-Brown′s Otorhinolaryngology, Head and Neck Surgery. 7 th ed. London: Hodder Arnold; 2008 . 36. Meyer C, Valfrey J, Kjartansdorttir T, Wilk A, Barriere P. Indication for and technical refinements of submental intubation in oral and maxillofacial surgery. J Craniomaxillofac Surg 2003;31:383-8. 37. Stranc MF, Skoracki R. A complication of submandibular intubation in a panfacial fracture patient. J Craniomaxillofac Surg 2001;29:174-6. 38. Amin M, Dill-Russell P, Manisali M, Lee R, Sinton I. Facial fractures and submental tracheal intubation. Anaesthesia 2002;57:1195-9. 39. Gordon NC, Tolstunov L. Submental approach to oroendotracheal intubation in patients with midfacial fractures. Oral Surg Oral Med Oral Pathol Oral Radiol Endod 1995;79:269-72. 40. Dosemeci L, Yilmaz M, Yegin A, Cengiz M, Ramazanoglu A. The routine use of pediatric airway exchange catheter after extubation of adult patients who have undergone maxillofacial or major neck surgery. A clinical observational study. Crit Care 2004;8:R385-90. 41. Vidya B, Cariappa KM, Kamath AT. Current prospectives in intra operative airway management in maxillofacial trauma. J Maxillofacoral Surg 2012;11:138-43. 42. Khadhim AL, Sheahan P, Timon C. Management of life-threatening airway obstruction caused by benign thyroid disease. J Laryngol Otol 2006;120:1038-41. 43. Kim DW, Jang JY, Shim H, Jung JY, Kim EY, Nam W, et al. Removal of aspirated teeth in multiple trauma patient, using fiberoptic bronchscopy with simultaneous tracheostomy: Review of two cases. Respir Care 2014;59:e1-4. 44. Straetmans J, Schlondrff G, Herzhoff G, Windfuhr JP, Kremer B. Complications of midline-open tracheostomy in adults. Laryngoscope 2010;120:84-92.